The playoffs are upon us and that means it’s time for a closer look at the first round matchups. The Ottawa Senators will face the Boston Bruins for the first time in the Stanley Cup Playoffs, but that’s not to say there isn’t any intriguing history between the clubs. While it may feel like an eternity ago that the Senators opted for defenceman Wade Redden over Zdeno Chara, some are suggesting that the Slovakian blueliner may still be looking for a measure of justification. The Senators aren’t labouring under lofty expectations, as they have some of the worst possession and defensive numbers among playoff teams. They’ve also scored the fewest goals and haven’t excelled on special teams, plus they’re the only post-season qualifier to boast a negative goal-differential. Does this mean the Bruins are in for an easy run? Not exactly. Boston had periods of difficulty in the regular season and things looked dire down the stretch. Head coach Claude Julien was canned and replaced by Bruce Cassidy. The Bruins rode to an 18-8-1 finish and will lock horns with the Senators with a little momentum on their side. The Senators finished the regular season with a 44-28-10 record and scored a measly 212 goals. Non-playoff teams like the Carolina Hurricanes, Philadelphia Flyers, Tampa Bay Lightning, and New York Islanders have scored more. But in the post-season, teams can make a lot out of a little. The Senators will hope to tighten things up defensively, but they’ll have to score to win. Defenceman Erik Karlsson leads the way in scoring with 71 points in 77 games, while Kyle Turris finished at the front of the line in goals with 27. Mike Hoffman had 26 goals and Mark Stone had 22. The Senators have demonstrated a particular and even peculiar adeptness when it comes to winning close games. They’ll have to keep it close against the Bruins because the goals won’t be coming with much frequency. Mucking it up is their best option. The Bruins scored 234 goals in the regular season, with only the Senators and Montreal Canadiens scoring less among Eastern Conference playoff teams. The emergence of Brad Marchand as an offensive threat is probably the biggest surprise along the way, with the forward putting up 85 points in 80 games. Marchand’s 39 goals lead the way for the Bruins, while David Pastrnak’s 34 goals amount to second place. David Krejci had 23 goals and Patrice Bergeron had 21 goals. That’s not a bad complement of players when it comes to offence, but Boston isn’t going to light it up in the first round. That might be okay. The edge, if they can find it, will come if Marchand turns it on. The 28-year-old finished the regular season serving a suspension and will be ready to rumble against the Senators. He’ll be hard to handle, but he’ll need a little discipline if he wants to be all that he can be. Defensively, the Senators are stingy but not stingy enough. They allowed 214 goals, just two more than they scored in the differential. That could be a problem if they intend to play close games against the Bruins. Ottawa doesn’t play a possession style of hockey and they’ve got the second-lowest Corsi percentage of all playoff teams. Having Karlsson on the back end gives them wheels and responsibility, but he’s recovering from an injury and may miss a step or two when he jumps back into the lineup for Game One. Dion Phaneuf will gobble up ice time. He averaged 23:03 in the regular season and put up 30 points. Cody Ceci averaged 23:12 a game and has the size and point shot to crack a game wide open, while Jyrki Jokipakka is a sound blueliner who averages about 14 and a half minutes a game. Marc Methot is still out with a finger injury. The Bruins allowed 212 goals against, but they own the best penalty kill in the league. Chara is the key mover on the blueline, averaging 23:20 of ice time a game and dominating from a physical standpoint. He also comes alive in the post-season in a way that makes him hard to stop. Unfortunately, Boston may have to make do without defenceman Brandon Carlo. The rookie was injured in the last game of the season thanks to an Alex Ovechkin hit, but he proved himself a dynamo down the stretch and averaged 20:49 of ice time a game. The Colorado Springs native had 16 points in 82 games. The Bruins are also without Torey Krug, which could make things tricky. Adam McQuaid will see an upgrade in ice time, although he’s already been playing over 18 minutes a game. Ditto for Kevan Miller, one of the team’s best all-around defencemen. The Senators have split things down the middle in terms of goalies, but Craig Anderson has gone above and beyond the call of duty. With his wife undergoing cancer treatment, the 35-year-old missed chunks of time but still put together an impressive campaign. He finished with a 25-11-4 record and a .926 save percentage. He also posted five shutouts. Backup Mike Condon went 19-14-6 with a 2.50 goals against average and a .914 save percentage. He came up big in relief and faded to the background upon Anderson’s rightful return, but the 26-year-old did what was asked of him and then some. He could still be a factor. Tuukka Rask was once again awesome for the Bruins. He went 37-20-5 and saw a lot of rubber, coming up with a 2.23 goals against average and a .915 save percentage. He earned eight shutouts. 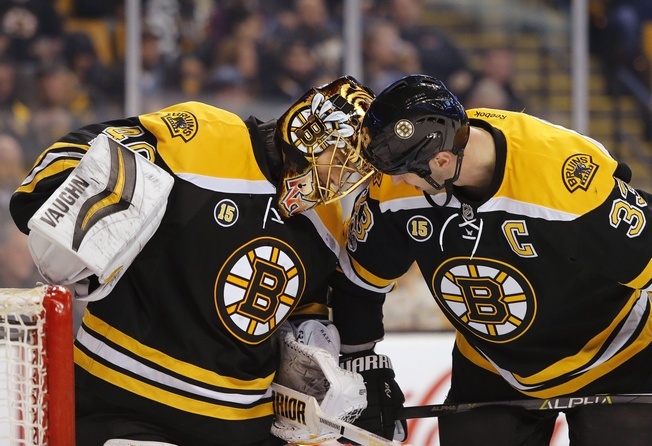 The writing on the wall is clear: if Rask does well, Boston does well. Anton Khudobin is the backup. The 30-year-old picked up seven wins and posted a save percentage of .904. He won’t steal many games and is less reliable than the Bruins would like, but this is Rask’s show. It won’t be easy for the Senators. They’re in tough against a prepared and experienced opponent and they have trouble scoring. That doesn’t bode well, but Ottawa does have some intangibles in their corner. The play of Craig Anderson could give them a boost, for one, and Karlsson is one of the best defencemen in the NHL. Unfortunately, the same can be said for the giant at the other end of the ice. And if defence is what this series comes down to, the Senators are looking at an early exit. My call: Boston in five.